So, you have some leftover Easter eggs and are wondering what to do with them? Here’s an idea… Teereet (Tirit) – Easter Egg Salad, Armenian style. When Lucine Kasbarian emailed me her family’s recipe for ‘Tirit” over the weekend, I had a startling realization. I wrote about my mother-in-law’s ‘teereet’ recipe 2 years ago, but neglected to include it in the recipe link on the website! Although our recipes are spelled a bit differently (I spelled ours ‘teereet’), the ingredients in both versions are pretty much the same. The Kalajian recipe is now officially added to the list, which you’ll be able to compare with Lucine’s family’s version below. "Armenians customarily served tirit following Lent on the Saturday before Easter, and on Easter Sunday after the egg competitions are done. ... the egg is a pagan symbol of rebirth, widely used in spring festivals before its adoption by early Christians as a symbol of the resurrection of Jesus. 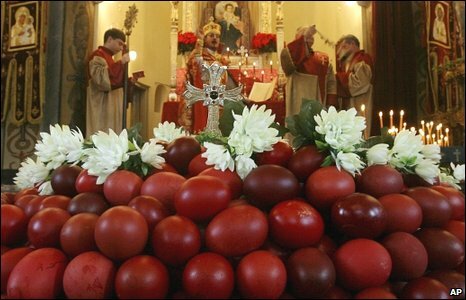 Friend Arevig Caprielian, born in Armenia, tells that the "red" coloring of the eggs symbolizes the blood of Christ. In Armenia on Easter, after the egg competitions, families plant the cracked egg shells into the earth." Mix all of the ingredients together. Serve immediately. I always knew tirit as a potato salad with parsley and onion seasoned with Aleppo pepper, salt and I suspect allspice, perhaps I am wrong. Tirit is pre-Easter tradition at my house. This along with tanabour (mazdoon-barley soup) which is dubbed "Jesus Soup" when eaten on Saturday night! Is tirit a Dikrangertsi thing or do others do this? My family, which is from Aintep, makes it following the posted recipe, with a couple of minor variations: Instead of onion, we use spring garlic (so it's just spring garlic and scallion). You can add a little Aleppo pepper for color if you like.